Well, spring is coming, and it’s time for me to start selling my agate collection. I have not even gotten halfway through a detailed inventory of the whole collection, but I know enough of what’s there to begin selling what I would consider to be some of the most desirable agates in the collection: those from the ranches now closed to rockhunting. This means cutting material and specimens from the Walker and Singleton Ranches. In the Fall, I sent out an email asking those on my email list how they would like to purchase the agates, and almost half of those who responded said they would like to purchase the agate in 5-gallon buckets, unsearched since the time I filled them. So that’s what I’m going to start with. 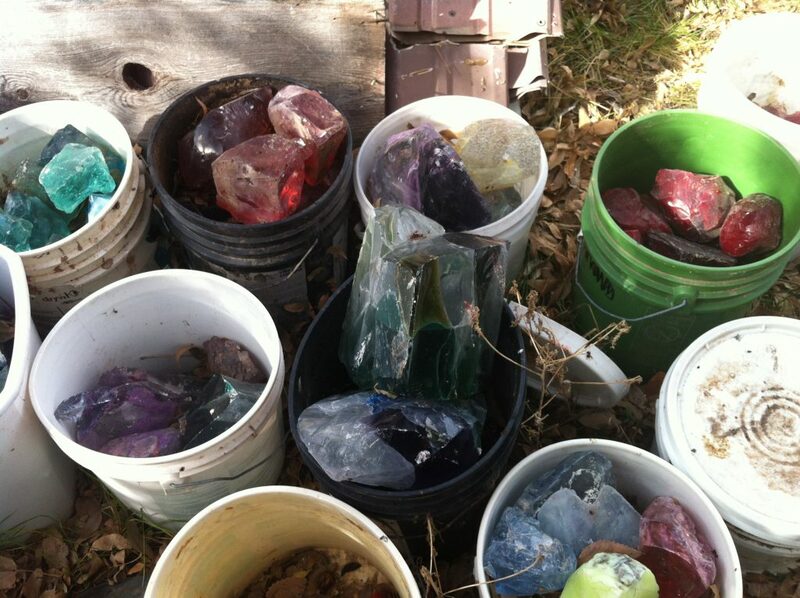 Full 5-gallon buckets of Walker Ranch or Singleton Ranch agate will be $250.00 each. These buckets will contain a mix of cutting material and specimens, but most of the material will be for cabbing or tumbling. When I filled the buckets, I packed them, so most of them will weigh about 50 lbs., and have a mix of larger and smaller pieces. If you only want larger pieces that you can slab, these buckets are not for you, since I filled in the spaces left between bigger pieces with tiny ones. My philosophy is that if you can make a nice cab or tumbled stone out of it, it’s a keeper. The Walker buckets can also contain a few Native American artifacts or reduction chips, including scrapers of various sizes and materials. Many of these rocks were collected quite a while ago, while others came from the most recent years when the Singleton and Walker Ranches were open. Most of the buckets are not marked as to date collected and packed, but some are. In general, those collected earlier may have bigger pieces in them, since there were more big pieces easily available in the first seasons the ranches were open. But agates collected later may be of a generally better quality since I learned as I went along and only picked up the best things I found every time I collected. If you have a desire for material collected early or late, let me know and I’ll try to get you buckets from the time frame you wish. I can generally tell when things were collected by their location in my yard, even if they don’t have dates on them. Right now I probably have 30 – 40 buckets from each ranch ready for pickup, out of a total of over 150 buckets from each ranch. And I still have over 150 buckets where the identifying paint has faded and I’ll have to open them in order to determine what they are. 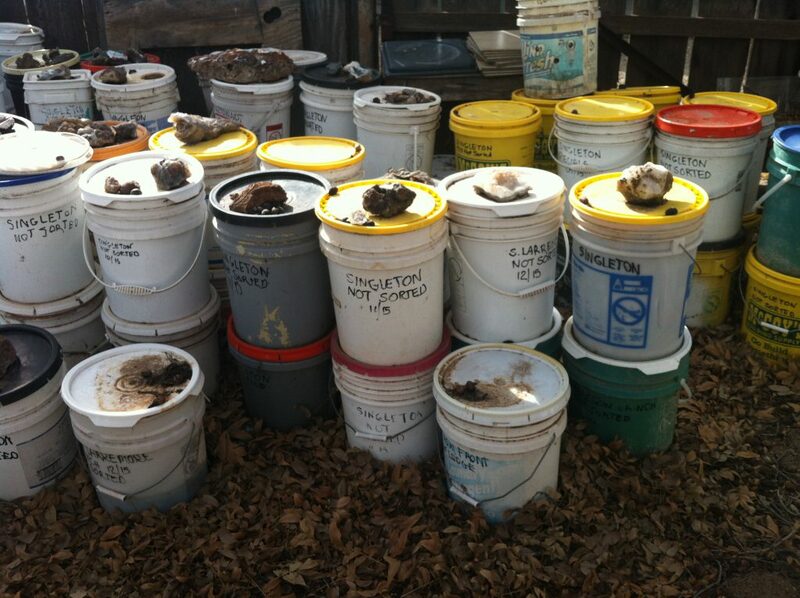 I also have buckets available of specimen material from the Walker and Singleton Ranches. These buckets can contain quartz and calcite crystals, in small and medium pieces, or geodes, saginite and calcite pseudomorphs, tube agates, botryoidal pieces, and pieces of plume or bouquet agate where the background has not yet filled in. Walker Ranch buckets can also include pieces of a flint-like material that is often pastel and can have very interesting shapes, and perhaps a bit of amethyst. Singleton Ranch buckets may also contain brecciated opal pieces that can be spectacular, and an occasional piece of basalt with tiny bits of moonstone in it. Specimen buckets are $150.00 each. I have one huge specimen lot that came from Telephone Hill on the Singleton Ranch. 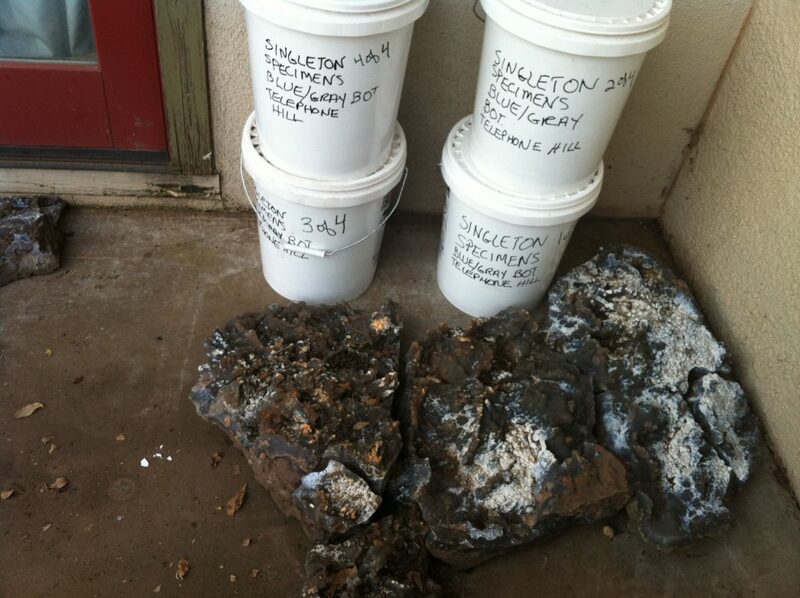 It’s a huge botryoidal geode in at least ten major pieces and more than 4 5-gallon buckets of minor ones. After you put it back together, it will be spectacular! I’ve figured out how seven of the major pieces go together, basically, and it will have a curved bottom and a diameter of probably 3 to 4 feet. The colors are blues, grey and white. The whole thing would make a great display either as separate pieces or put together. All of it is for sale together for $750.00. I have also had many requests for geodes, and I have probably 30 5-gallon buckets full of Mexican geodes that I purchased over the years. They are in sizes ranging from a chicken egg to bigger than an emu egg. I’m willing to offer these by the pound as well as by the bucket, since not everyone wants a whole bucket of geodes. But the general consensus was that grandkids loved geodes, so it’s good to always have some around. I’ll sell any quantity of a pound or more at $3 per lb., no matter what size they are. Buckets will generally weigh light, because geodes leave a lot of air space, so I’ll just weigh the full buckets and sell the whole bucket at $2.75 per lb. I’ve got lots of other categories of agate and other materials in my collection, but I needed to start somewhere. While the rest of my collection will be available once I have finished my inventory, some other things can perhaps be made available this spring if you let me know in advance so I have time to locate and pack them for sale. These other things include: agate from all the ranches I currently lead field trips on, and miscellaneous U.S. agate for $200.00 per 5 gallon bucket; agate from Mexico either organized by what it is or where I got it at anywhere from $200 to $600 for a 5-gallon bucket; and large agate and petrified wood pieces (from about 10 lbs to over 400 lbs) at $2 per lb. And there’s also over a ton of beautiful slag glass in all colors at $6/lb for up to 20 lbs, $5/lb for 21-100 lbs, and $4/lb for 101 lbs and more. The sooner you let me know what you want, the more likely you are to get it this spring. Send me an email stating your name, cell number, what you want, and when you are going to come to get it. I’ll reply letting you know the agate is being saved for you. You can either pay in advance or when you pick it up. I’ll accept both cash and checks. Now, as for delivery: right now I’m hoping that y’all will come out for rockhunts this spring and pick up your purchases then. If you can’t do that, please still let me know what you want to purchase, and I’ll put it aside for you. Perhaps we can make some arrangements for delivery. My son lives in Kerrville, and he could probably take a bucket or two home with him when he comes to visit, so that might be an option if you live near the Hill Country. I’m not able to lift a 50-lb bucket, so if y’all need help with moving them, perhaps we can split them into more than one container to lift. If you have any questions or comments, please email me. Below is the list of spring 2019 Rockhunts, including those in January which have already been published. As usual, all trips start in front of the Antelope Lodge, 2310 W. Highway 90, Alpine. To reserve your place on a trip, email me at agatehunter@sbcglobal.net. Payment for the trip is not due until the morning of the trip. All the ranches accept cash or check, and the Stillwell also accepts credit cards. At least one person in your group needs to be a member of the Rollin’ Rock Club to go on the trips. Cost is $10 per year for a single membership and $16 for a dual membership, purchasable at the time of the trip. I’ll be out of town until the 18th, so, while I’ll be accepting reservations via email immediately, I may not send you a detailed response until at least the 19th. Answers to most questions concerning rockhunts are available on my website (really, they are there!). If no one is signed up for a trip 48 hours before it starts it will be cancelled. Once cancelled, it can’t be “un-cancelled”. So be sure to sign up! Since the Antelope Lodge has changed ownership, the prices have gone up somewhat, and the amenities are different. But the reservation website name is the same, www.antelopelodge.com. I hope to see y’all this spring! Hi y’all! It’s been one heck of a winter, and I’m only now crawling out from under the mound of paperwork (22 years’ worth) that had to be sorted and organized for our taxes this year. Below is the schedule for the spring, starting with the Gem Show week of March 25 – April 1. I intend to have some rockhunts the first week in May, but that schedule will have to come later. Also, the Stillwell Ranch is up for sale. As we know what may happen to rockhunting opportunities once a ranch sells, I would suggest visiting that wonderful spot this spring, in case it becomes unavailable in the future. To sign up for the field trips, send me an email. HOWEVER, I will be involved in family business and out of email range and won’t be able to reply until about the 23rd of March. If I have access to email earlier than that I’ll certainly get back to you. But if the information isn’t in this email or on my website, you may have to wait until the 23rd to find out. Remember that you need to be a member of the Rollin’ Rock Club to go on my trips. Memberships are $16 per year dual and $10 per year single, payable at the time of your first field trip. Monday, 3/26 Stillwell Ranch, 8 a.m. 50 cents per lb of rock you take. Saturday, 3/31 Stillwell Ranch, 8 a.m. 50 cents per lb of rock you take. Sunday, 4/9 Stillwell Ranch, 8 a.m. 50 cents per lb of rock you take. Sunday, 4/22 Stillwell Ranch, 8 a.m. 50 cents per lb of rock you take. Sunday, 4/29 Stillwell Ranch, 8 a.m. 50 cents per lb of rock you take. Wow! It’s been almost a month since the April rockhunts, and I’ve been practicing sleeping in late and being incommunicado . But now, in a small flurry of activity, I’m going to send out an email! I had a great time leading all the spring rockhunts, and I think everyone that attended had a good time as well. I found some incredible agate, especially at the Singleton Ranch and the South Larremore Ranch. I am very pleased with the variety and quality of agate found at the South Larremore Ranch, and just a little bit puzzled geologically about how it all got there. But the important thing is that it DID get there, and we can find it in reasonable sizes and quantities for cutting and specimens. And there’s still some of that ranch to be explored. I saw lots of old friends and made some new ones. As usual, we had people fly and drive in from around the United States, including people from Florida, Virginia, Michigan, Wisconsin, Arkansas, New Mexico, Arizona, California, and Oregon, and of course all over Texas. Johnny French brought barbecue for the group and we had a fantastic dinner during the April hunts. In general, the weather cooperated with us, especially in April. It had rained earlier on the Larremore Ranch, however, which left the usually-not-difficult creek crossing a muddy mess. So, twice, we got all hands on deck with shovels and picks, and fixed the crossing so that all the vehicles on the hunt could get across if they chose to. We also ganged up to pile rocks in holes and fix roads on the Singleton Ranch. We also took several trips to the Stillwell Ranch. I was really happy with the agate I found, and the petrified wood was excellent. You can hunt the Stillwell Ranch on your own if the weather is cool and the roads are dry, but going on a trip with me means I can probably help you find a good spot to hunt and identify what you’ve found in the field, so you don’t pay for rocks you really don’t want. The fee is very reasonable at 50 cents per pound, and of course I don’t charge anything, so the only big expense is your gas. And the Stillwell Store has ice cream bars and cold drinks for an after-rockhunt treat. I’ve also relearned some lessons that I used to know. I need to take a day off once a week, so that I can catch up on sleep and laundry. I need to be more clear in my instructions, and I need to have samples and maps for every ranch. I’m closing up for the summer, and probably won’t have any more field trips til the beginning of October. I’d appreciate input from y’all about the schedule, since I tried to cluster more rockhunts together in the middle of the month rather than running several weekends a month like I had last year. Please let me know whether that worked better for you or not, and how you think I can improve the schedules in the future. I hope to have time to work on the museum this summer, and on the set of photos I’m displaying in my slide show there. If anyone has some photos of the hunt, or of the material you’ve found, whether rough or processed, and wouldn’t mind having me use them in my slide show, please email them to me. I’ll add your name and a copyright line for you, and they won’t be used for anything except the slide show in my museum. Lastly, I’ve been trying to contact Paul Bowman, who came out on the April field trips for the first time, and his email address is rejecting new messages. If anyone knows him, please tell him to email me! Thanks!